"All photographs are memento mori." As in ethyl. One of Lowell's oldest gas and service stations, I've come to think of it as a cultural icon. View of Lowell, Massachusetts, looking southwest toward the commercial district. City Hall can be scene in the distance, to the right of the Sun Building. This is one in a series of shots of what used to be the infamous Tyngsboro Trailer Park, located on a cul-de-sac by the banks of the Merrimack River. One can only imagine. I've tried to find evidence of the site's former incarnation, but so far it's eluded me. The place has been sanitized beyond belief, which somehow seems wrong, or at least disrespectful. It's as if to say the Trailer Park never existed. An older shot, from 2008. The vividness of the ocean colors is due for the most to the Foveon sensor of the Sigma camera it was shot with. Not the best composed shot in the world (I was on a rapidly moving boat) but it captures the essence of the local ambience along the Grand Canal. 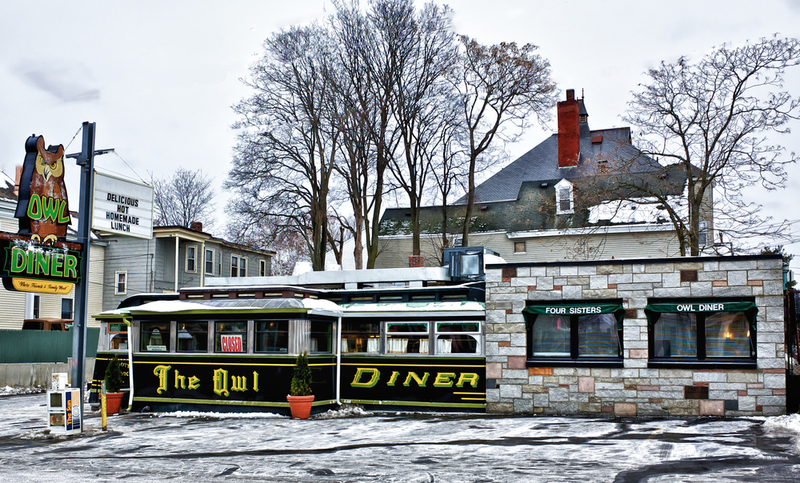 This is the Owl Diner, a Lowell landmark of sorts. A classic breakfast eatery, it's the sort of place where politicans , wheeler-dealers, ex-pugilists, and regular people congregate. Seats are scarce on weekends, but it's probably worth the effort, just to be able to say you've been there. If you're into that sort of thing, that is. Former factory/mill site in Lowell, now home to a boxing gym.